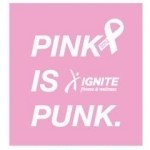 This month Move One are proud to once again to support The Ignite fitness & wellness PINK IS PUNK campaign. Back, bigger than ever, better than ever and ready to raise funds and support for the Safe & Sound Breast Cancer awareness campaign. Ignite Fitness & Wellness have planned a series of cool events throughout October to keep you active and entertained whilst supporting this fantastic cause and it all kicks off with the Ignite Swim & Run at Anantara Dubai Palm Jumeirah Resort & Spa.